House Clearance Service In All Areas Altham Church Clayton-le-Moors Great Harwood Oswaldtwistle Rishton. Hi i am looking for a price to have a two bedroom property in Accrington – Hyndburn Lancashire cleared and cleaned. The property has two small bedrooms, a kitchen, a bathroom, a dining room and a living room, also there is a loft and an outhouse that will need cleared. There is not a lot of items in the property worth a great deal, though they could possibly be donated to charity. 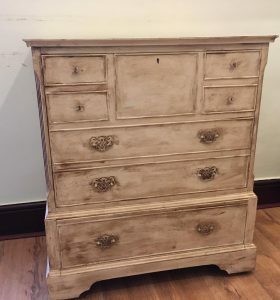 A hand painted cream rustic solid wood chest of drawers, having two small drawers to either side of a drop down shelf, with two small over one large drawer underneath. 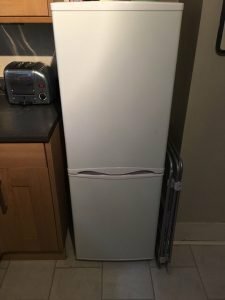 A tall standing white two door Currys Essentials fridge freezer. 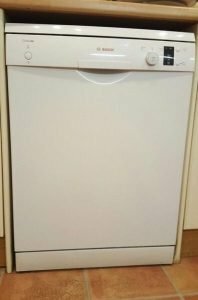 A white Bosch Classix 60cm under counter dishwasher. 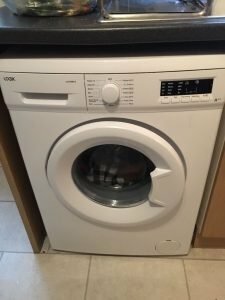 A white Creda 5kg under counter vented tumble dryer. 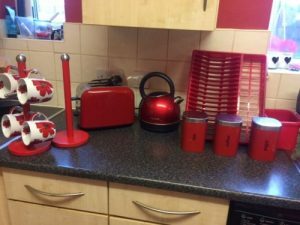 A large collection of red kitchen accessories, to include a metallic red kettle, a two slice toaster, a kitchen roll holder, a mug tree with four mugs, a dish drainer, a utensil holder and tea, coffee and sugar canisters. 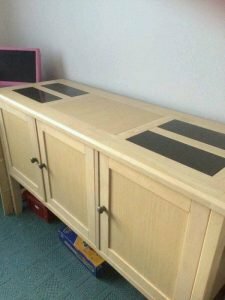 A large solid pine and black glass sideboard, having a double cupboard aside a single cupboard. 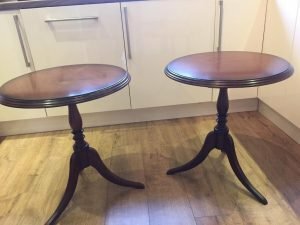 A pair of vintage solid mahogany circular topped lamp tables, each on three splayed legs. 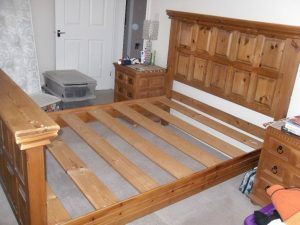 A vintage solid pine double bed frame, together with a pair of matching six drawer bedside drawers. 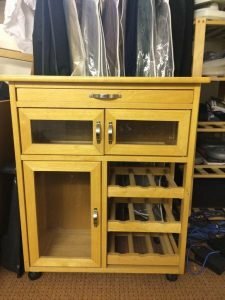 A solid pine double kitchen trolley on castors, having a pull out chopping board above a double slim cupboard, and a single cupboard aside three wine shelves. 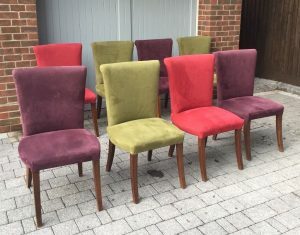 A set of eight high back dining chairs on solid wood legs, upholstered in purple, green and red faux suede. 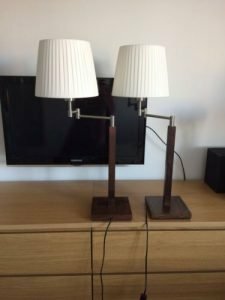 A pair of John Lewis chrome and oak unusual shaped table lamps, each with white pleated shades. 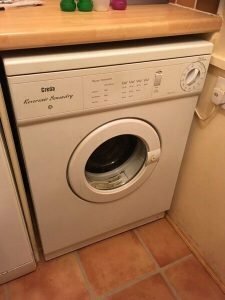 A white Logik 7kg under counter washing machine. 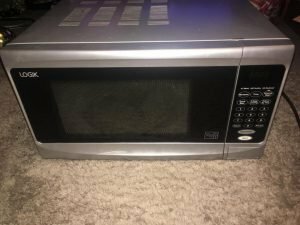 A silver Logik 800W 20L microwave oven. 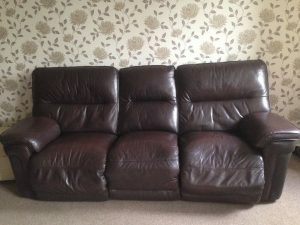 A three seater high back reclining sofa, upholstered in chocolate brown faux leather. 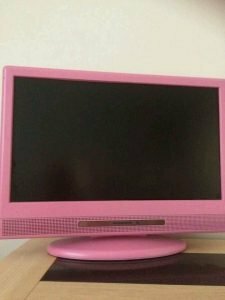 A pink surround 22 inch flat screen television with a built in dvd player. 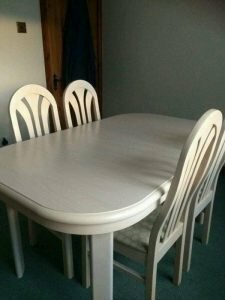 A curved edge large beechwood dining table, together with four matching curved back dining chairs, upholstered to the seats in lime green patterned fabric.